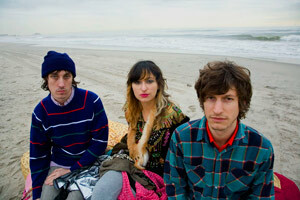 The three members of the Brooklyn band Seasick come from pretty disparate backgrounds — musical and otherwise — but together they make music that’s tighter than skinny jeans after Thanksgiving dinner. Singer Jasmine Golestaneh is a guitarist, healer, mystic, and visual artist of Latvian and Iranian descent, who’s lived in Florida, Paris, and London. California-born drummer Sam Levin studied jazz at NYU and now teaches kids from Harlem to play percussion. 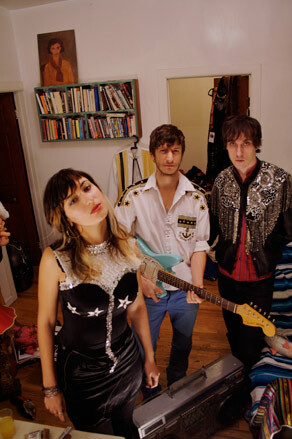 New York native Eddie Cooper, who recently joined the band and alternates between guitar and keyboards, counts playing with hop chanteuse Princess Superstar in Berlin among his life experiences. Seasick creates the kind of imaginary geographic community we’d all want to live in — one where Berlin’s Zoo, Laurel Canyon, the East Village, and healing Latvian thermal waters are melded into one sonic pot, mashing up rock, folk, psychedelic sounds, and mysticism. 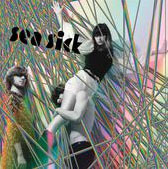 Their latest EP, Seasick, was recorded and mixed by Victor Van Vugt (who’s worked with Nick Cave and PJ Harvey) and Paolo De Gregorio (We Are Scientists) and mastered by Kramer (Daniel Johnston, Will Oldham). The mood of the album can be summed up in the lyric: “the other side of life is on the radio.” When you listen to this EP, you can’t help but feel that there is another side of life — a psychedelic B-side we are all living without being aware of it. Hanging out with them in their Brooklyn loft adorned with their maritime muse — an inflatable swordfish — Italian writer Chiara Barzini felt she had stepped into a Seasick’s world… or rather, into an aquarium. Chiara: What experiences led you to start playing music? Jasmine: When I was a teenager, I was obsessed with Nirvana. I would spend hours mesmerized by videos of Kurt Cobain singing and playing guitar. He articulated the essence of everything he was feeling, from violence to tenderness, so seamlessly. I loved how entranced he was by the music he was playing, the intensity of his being. Playing music seemed like the most exciting and worthwhile thing to do in life, so I got an electric guitar. Then after ten years living in the UK, writing songs in bedrooms, and jamming with different people, I wanted to form my own band. I wasn’t so into the scene in London at the time, so I moved to New York. Seasick’s first incarnation started in 2003 — it had a different name and a different set of people, but that’s when the spirit was born. Chiara: You are also an energy healer. How does your spiritual side influence your music? Jasmine: Channeling energy and writing music are all part of the same process of being within myself and extending beyond myself at the same time. When I’m present in that way, songs pour through me, and I transmit what I hear. I couldn’t have a band without that. Chiara: It seems like the world feels inexplicably different these days. Is any of your music borne from this feeling of change? Jasmine: I think humanity is undergoing a huge shift in consciousness – moving into an age of both extreme self-awareness and self-destruction. I experience it personally as a feeling of ecstatic danger. It’s very inspiring, I hear it in our new songs, and I feel it when we’re performing. Chiara: You and Sam have been a couple for a while. You must be used to this question… how does it feel to be in a relationship with Sam while being in a band together? Jasmine: Sam and I met through Seasick. I was looking for a drummer, and I put up an ad… he responded and was perfect. We didn’t start dating until about a year and a half later. There’s a crazy surge of magic, power, and invincibility that comes from playing music — I think being in that atmosphere together is what made the relationship happen. Before we were together, the three of us would hang out every night in bars, dancing on tables, singing in the streets — we were a silly, boisterous trio, always leaping around like maniacs. There was something very liberating about being in that dynamic with two men. I’d been with some very brooding lovers, and Sam was a breath of fresh air. Three years later, we live together and we’re still in a band together. I’d say the main challenge is creating boundaries as to how we’re involved in each other’s lives… and not taking each other for granted. The excitement of sharing music is still there, and I think that’s a big part of what keeps us evolving together. Chiara: What kinds of people come to your shows? Jasmine: It seems like our fans are interested in art and spirituality, and where those two realms cross. The music is raw and emotional — it’s not Teflon-coated indie pop, it’s more like a cast iron skillet. Our audiences have included everyone from bums to clowns, big artists to poetic hairdressers, psychic astrologers to subversive secretaries. Chiara: Sam, you’ve spoken a lot about your unconventional recording process for this album. I understand it came about as a series of alchemies. Sam: Well, it took us fourteen months to get seven songs done. We learned a ton about the process of making an album. We also went from working in a home-built studio in our friend's apartment to recording guitars and vocals in Victor Van Vugt's studio with gold records hanging in the bathroom. The music was recorded in a total of four different places. We didn't do things the conventional way, but we did manage to do it for almost no money, which was a pretty big accomplishment. We're really happy about how it turned out. Chiara: Sam, you’ve been teaching drumming to elementary school students — how do you feel that’s affected the spirit of the band? Sam: The kids I was teaching were about nine to thirteen years old. It was really a creative project unto itself figuring out how to get those kids interested in something that they've never dealt with before — like tribal music from Africa, Louis Armstrong, Art Blakey, The Roots, Africa Bambata, or Kraftwerk — they really dug the Kraftwerk. I don't know if it affected the spirit of the band, but it was definitely a constant reminder for me to pay attention to the really essential aspects of music. Chiara: Eddie, the three of you have completely different backgrounds — how does the synergy work? What seems to be the common language? Eddie: What's been so incredible is the way the overlapping elements of our tastes and styles form a rock-solid geometry we all feed off of. For me at least, being a part of the band doesn't involve shutting off any significant portions of my musical tastes — and I never thought that would happen. We share a common attitude towards our influences — that they may shape our histories, but the most important thing is to generate something new out of them. 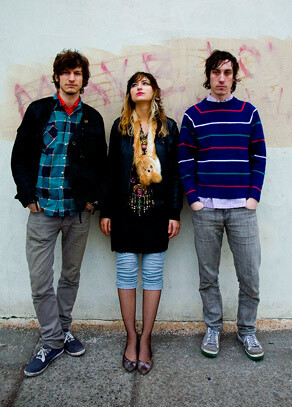 Chiara: The previous keyboard player, Geoffrey Lee, left the band to pursue a PhD, and you’ve jumped in. Was that an easy transition? Eddie: Becoming a part of the band has felt completely natural. I already loved the material that Geoff had created, and initially I just concerned myself with recreating them with my own setup. Lately I've been playing much more guitar, even adapting some of the keyboard lines from older songs. It's definitely had an effect on our sound, a fact that made me nervous at first, to be honest. I thought they had achieved a very specific, unique sound, and I worried that I was infiltrating their vision. But I've become totally comfortable with my role in this process, and I think our new songs just speak for themselves. I'm not sure quite how to characterize the direction we're going in these days, but there's a driving quality, an undercurrent of aggression that we're all really excited about.